INAGH are this week celebrating their success in the junior championship after they proved too strong for Killanena last week in Tulla. 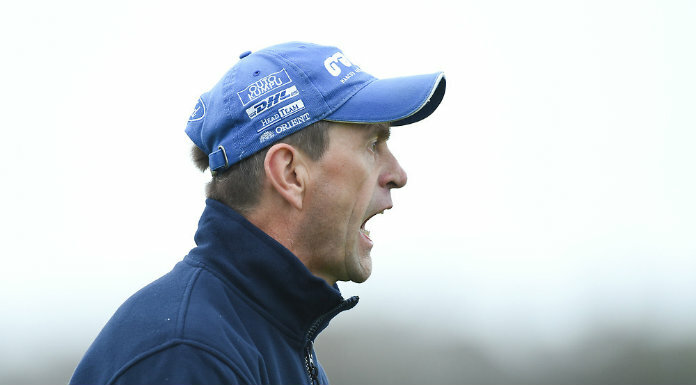 The conditions in Tulla on Sunday morning were wet and windy and Inagh showed themselves to be stronger and better able to adapt to the conditions. The winners’ forward line was stronger and this led them to go one step further than last year. Having lost out in the league final earlier this season, there were understandable scenes of great celebration at the final whistle. Patricia O’Loughlin had the game off to a flying start with a point inside the opening 30 seconds. Evelyn Glynn had the teams level after five minutes with a pointed free. Inagh proved the stronger though over the next 15 minutes as they dominated through Patricia McCarthy, Helen Hehir and Emily Lynch. The forward division made good use of the supply of ball coming through and Patricia O’Loughlin accounted for 1-1 with Helen Hehir also pointing. Killanena, however, didn’t let the heads drop and hit back for two of their own from Leona Leonard and Eveleen O’Brien. This brought the East Clare side back to within a goal and set the game up for a lively second half, when they would also have the wind at their backs. Indeed, O’Brien had the margin down to two points with just a minute gone in the second half. Inagh responded with a goal from Cathy McNamara. This put the eventual winners back into a five-point lead and this proved too much for Killanena. Both sides battled on but found scores hard to come by in the slippy conditions. Inagh eventually put the game beyond Killanena when Sharon Rynne goaled in the 18th minute. Patricia O’Loughlin added a further 1-1, while Killanena added points from Eveleen O’Brien and Leona Leonard but it wasn’t enough though as a stronger Inagh side won out to claim the title. 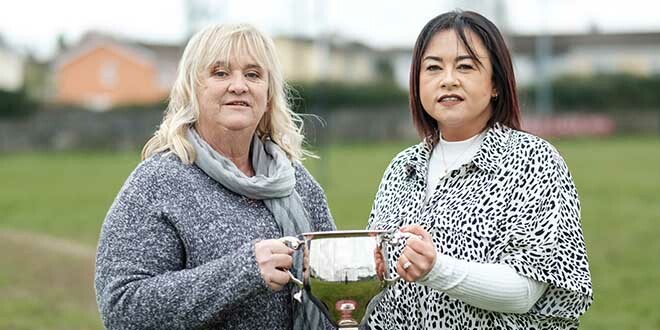 Cathy McNamara accepted the cup on behalf of the Inagh team from county secretary Mary Hogan. Inagh: Brid McCarthy, Gillian Lafferty, Aisling Rynne, Linda Toomey, Noelle Arthur, Michelle Rynne, Sharon Rynne, Patricia McCarthy, Tara Rynne, Helen Hehir, Emily Lynch, Patricia O’Loughlin, Cathy McNamara. Subs: Ciara Ryan, Roseanne O’Loughlin, Laura Rynne and Siobhán McNamara. Killanena: Anne McNamara, Alanna Moroney, Niamh O’Connor, Edel Broderick, Gráinne McNamara, Aoife Collins, Róisín Loughnane, Ciara McNamara, Joanna O’Brien, Laura Flaherty, Aoife Conlon, Leona Leonard, Eveleen Glynn. Subs: Sinéad Reilly, Deirdre Collins, Lorraine Moloney, Paula Bowes, Regina McCormack, Cassie Comerford, Sharon Keane, Kelly Ann Brady, Vashti Curran, Joanna Canny and Karen Hoey. Referee: Pa Sheedy, Smith O’Brien’s.